Middle Eastern Flavors are rubbed into the leaves and baked until crunchy. An explosion of flavor! Remove the thick, center ribs from each kale leaf on a cutting board with a sharp, small knife – cutting it away. 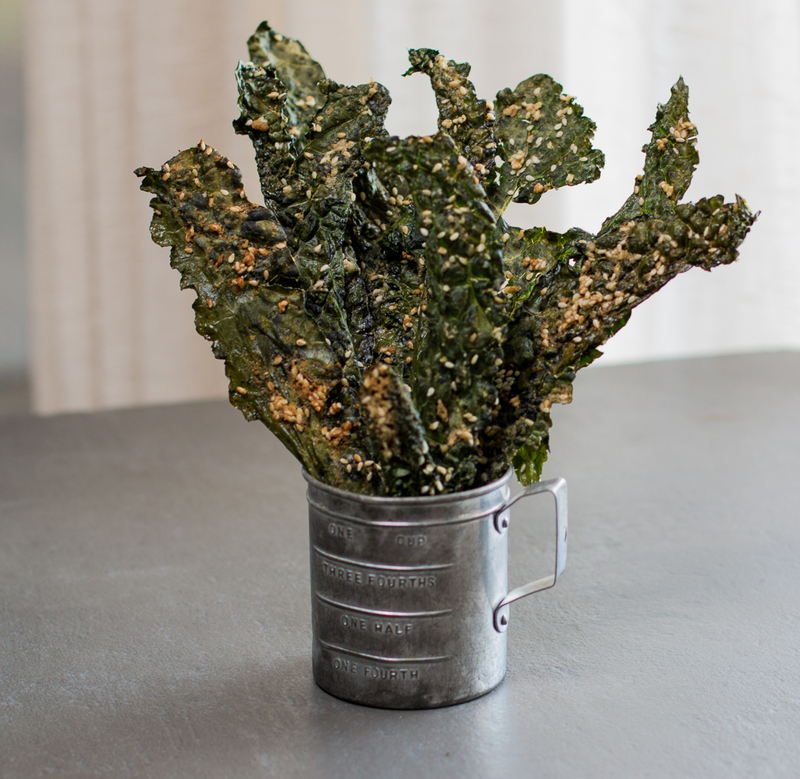 To achieve crunchy kale leaves, it is important to remove this rib, until about an inch to the top of the leaf. Wash the leaves, and place them in a salad spinner, in two additions until dry. Alternately, you can dry the leaves in a kitchen towel, or paper towels. Make sure the are VERY dry, or they will not crisp as nicely. 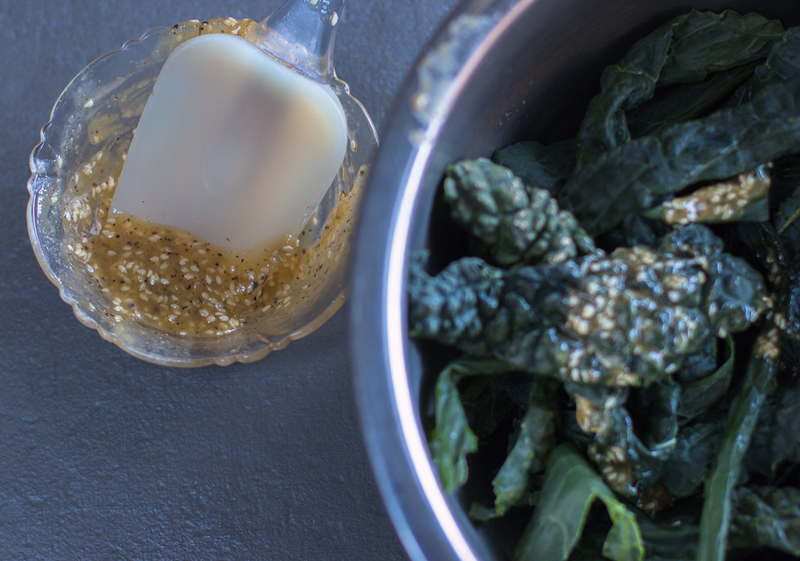 In a small bowl mix the next 8 ingredients; tahini through olive oil until well mixed with a fork. Add to the leaves in the bowl. With your hands, rub… gently massage the topping into the leaves until all is coated. Gets a little messy – yet you need you use your hands. Very lightly grease two rimmed baking pans. Place the leaves in a single layer on the pans, leaving a little space between them. When cool, store in an airtight container. Will last about 1 week… tastes best in the first few days. For RAW Chips: see above then use dehydrator to crisp. I start at a higher temperature (normally 145 degrees) and then after a period of time, usually 1/2 to 1 hour, reduce the temperature to 115. Yes, this is still raw, and no you are not compromising the nutrients. The thing to remember here is that the FOOD temperature never goes above 115. Use the mesh sheets of your dehydrator. Add the leaves in a single layer on them, leaving a little space between them. Dehydrate at 131 -135 degrees for about 2 hours total time, or until the chips are dry and crispy. See BLOG for many photos and how-tos.